Typographer Aaron Bell creates one-of-a-kind typeface. He's the program manager of Microsoft's Windows Font Team and he's particularly interested in Hangeul, whose creator is well known unlike other languages. His interest in Korean culture and history is so great that he even designed Saja, a typeface inspired by a cursive style from the Joseon Dynasty. Gaon-gil is a street filled with history and Hangeul-related artworks and organizations such as Hangeul Society. Here, Aaron Bell follows recommendations of Jo Myeong-hwa, the author of “Hangeul Journey,“ and looks around every corner looking for traces of Hangeul hidden in Seoul. The creator of Hangeul, King Sejong the Great, was born in Seochon, which is known as Sejong Village now. And his spirit can still be felt on the streets filled with Hangeul signs. Amazed by foreign brand names adorned with Hangeul, Aaron Bell takes pictures. Hyeokpilhwa artist Park Jae-chang paints and writes on durable clothes to create art. From birds and flowers to other animals, his art captivates Aaron Bell. 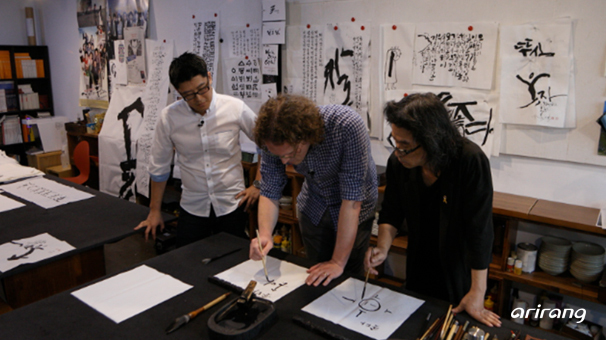 Kang Byeong-in is a calligrapher who draws inspirations from movements. From a letter that looks like a dog to a character that looks like a sprout, one can read the meaning of his art. Aaron Bell picks up a brush and writes letters under Kang Beyong-in's guidance and learns how to illustrate the meaning of a word. Lastly, Aaron Bell meets with a fashion designer who received global spotlight for incorporating Hangeul into fashion. Let's meet various styles of Hangeul through these 3 artists. In Jeonju Hanok Village, there are about 700 traditional style houses. And the village is filled with Hangeul signs, carpenters, and master seal carvers who still use minche, a style that was used among common people during the Joseon Dynasty. During his journey, Aaron bell copies various writing styles and receives inspiration. Let's follow Aaron Bell on his journey through the history of Hangeul.